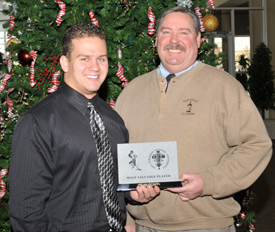 ESCC Player of the Year Tyler Hudetz with Joliet Catholic Coach Dan Sharp. 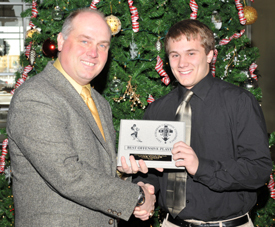 Carmel coach Andy Bitto with ESCC Offensive Player of the Year Mike Taylor. 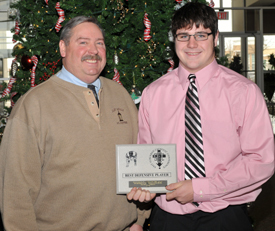 Carmel Catholic coach Andy Bitto with Offensive Lineman of the Year Patrick Lyons. 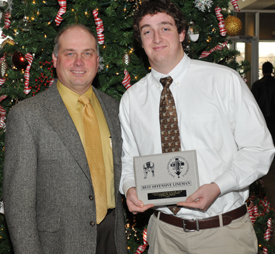 Joliet Catholic coach Dan Sharp with ESCC Defensive Player of the Year Joshua Mander. 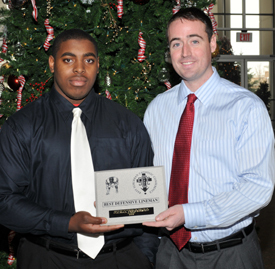 Marist coach Pat Dunne with Defensive Lineman of the Year Nabal Jefferson.